Last month, LinkedIn opened their publishing platform to the public on a limited basis. Out of 277 million members, they’ve invited 25,000 people initially to be able to share articles on the LinkedIn network. Today, I received my official invitation to be one of the early publishers on LinkedIn. This is a very interesting proposition that I’m keen to learn more about. That’s why I’m already brainstorming my first post. Why should we all be interested in LinkedIn’s publishing platform? There are a number of reasons we should pay attention to this opportunity. But, perhaps, the biggest and most important point is this: We get our expertise showcased to professional contacts through content. Harnessing the power of social networking is all about figuring out the best way to tap into the network’s built-in membership and/or visitors. And, in this highly digital world that we live in, we’ve been hearing the same adage over and over: Content Is King. LinkedIn is now offering us a chance to build a content kingdom in its professional network. Let’s put this in perspective in terms of statistics*: Facebook has 1.19 Billion members. YouTube has approximately 1 Billion unique visitors a month. Google Plus has 300 Million active users. Twitter has 230 Million users. Instagram has 150 Million Users. Pinterest has 70 Million Users. Looking at these numbers, we see that even though LinkedIn is not yet in the leagues of Facebook and YouTube, it is still positioned with the big players like Twitter and Google Plus. And, a bit ahead of the growing players like Instagram and Pinterest. The key difference with LinkedIn compared with the other channels, however, is that it’s the key player in professional social networking. So, out of those 277 million members, 100% joined LinkedIn for professional reasons. Everyone’s there to do business or to engage in business matters – whether looking for a job, finding someone to hire, searching for clients, and/or selling services. Therefore, establishing ourselves as a thought leader through our own unique content in a professional social platform can make a real difference in our work. A little while ago, I received one of those emails that said that my profile was one of the Top 1% most viewed profiles on LinkedIn. Along with a couple of million other members. To me, this means approximately 10-15 views on my profile a week. Some weeks, the views go for up to 30-40. Other weeks, maybe just 5-6 views. Doesn’t seem much. But, those viewers mean that they see my professional work and find out who I am and what I do. They may not convert immediately into direct referrals or client work, but we know that the more people who get to know us and our work, the better our chances of finding opportunities. I’ve had a few job and business leads due to LinkedIn, and at least a couple of those led to proper job offers (both, I had to turn down in the end!). Now, imagine the possibility of increasing that reach to LinkedIn’s professional members – not just through our profiles (that most people simply use as resumes) – but through showing our expertise and experience through content. 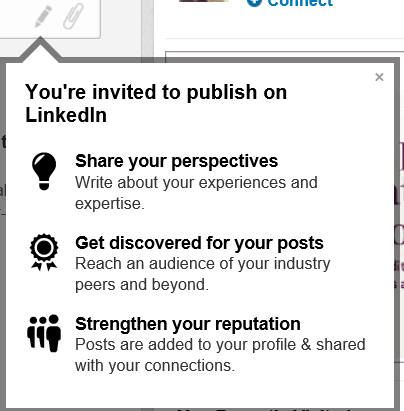 Of course, this will depend on how LinkedIn will serve the new content to its network as well. But, I believe that the ability to have that platform is a good one to have. Now, how do we make the most out of LinkedIn’s publishing platform? How about you? Have you explored LinkedIn’s Publishing Platform yet? Would love to know what you think of it! * Referred to this presentation for 2014 Social Media Statistics. Pinterest stats is from this post. Google Plus stats from this post.